Wait, what? Is Diddy, P. Diddy, Puffy or whatever the hell he's now calling himself still a musician or has he completely sold out to marketers? It certainly seems so because the only place the guy seems to appear anymore is in commercials. Now he's doing one for Burger King in which his cartoonish, self-important, overinflated ego is on full display. Saatchi & Saatchi's The Breakfast Club campaign for JCPenney has been crapped by everyone on since it launched. Today, it's Rebecca Cullers' turn. On AdFreak, Rebecca does the math, writing, "I was 3 years old when The Breakfast Club came out in 1985. I didn't know the film existed until I was in college, where it was included in a class on culturally significant movies for Gen X. Now, there's more or less a decade separating me from today's incoming high-school students. Does anyone really think they will get the reference?" She is absolutely correct in her analysis of the problem and for anyone at Saatchi or JCPenney not to have realized this is further confirmation far too many advertisers and their agencies, despite believing the contrary, are completely out of touch with reality. Islam is Cool. By the Way, Here's a Wife. Hoping to expand your nuptial smorgasbord? Add Shaadi to your list -- which, if you've been paying attention, should already include Russians, Filipinos and good white-bread Christian girls. 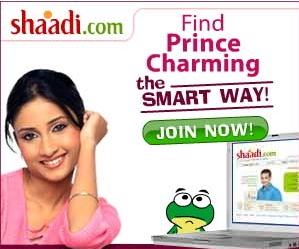 Shaadi is a conservative Indian "matrimonial" site, which I guess is less obnoxious than Filipina Heart's more overt cattle call. I found the ad alongside an article titled "Ad campaign promoting Islam angers NY lawmaker." Dude, that is some seriously misguided contextual action. Renaud, the author of Shoot My Blog, asked a bunch of other bloggers (including us; we declined) to shoot a digital photo of something with his blog in the background. Here are the results. It's cool that he got a bunch of people to go out of their way and do this for him, but what's it all for? 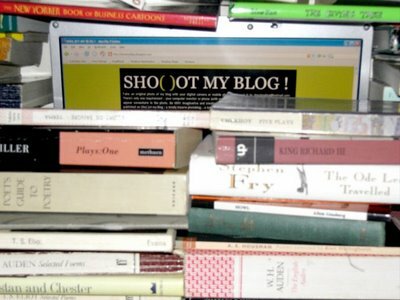 Like Paris Hilton circa 2006, the blog apparently only exists to be photographed. You wanna put an ad on that bad-boy or what? What? You thought it would never happen? Oh please. Of course you did. 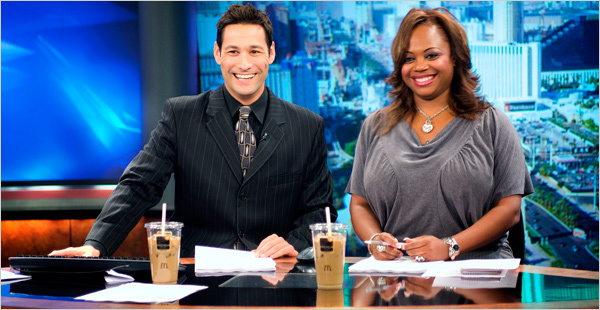 Meredith-owned Las Vegas Fox affiliate KVVU (and others) has accepted money from McDonald's for iced coffee product placement during its news and lifestyle newscast. Whatev. We're more concerned about that body sack Monica Jackson is wearing. So we do a lot of ad critique around here at Adrants. Sometimes it's worthy, other times it's the digital equivalent of a newspaper used for dog defecation. In what has to be the most ridiculous critique of a ridiculous ad EVAR, MSNBC Ads of the Weird takes on a Dr. Scholl's ad featuring America's Next Top Model Runner Up Yaya DaCosta who dances on a desk and then jumps into a pair of shoes which, naturally, have Dr. Scholl's inserts. 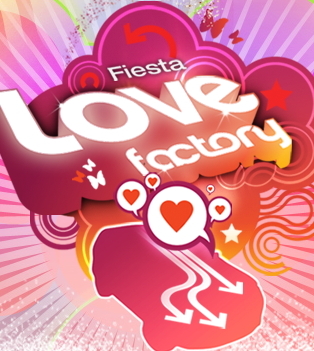 Promotional video of the Fiesta Love Factory features people in various states of G-rated ecstasy. Those warm fuzzies are then conveyed out of their bodies and into a Ford Fiesta. And lest we forget, Ford was the first home of the assembly line -- which is cool considering it kicked off our industrial revolution and all, but those first assembly line vehicles weren't made with vicarious bliss. They were made on the backs of tired, underpaid mummies and daddies. Think about that next time Papa comes home and demands his nightly gin.